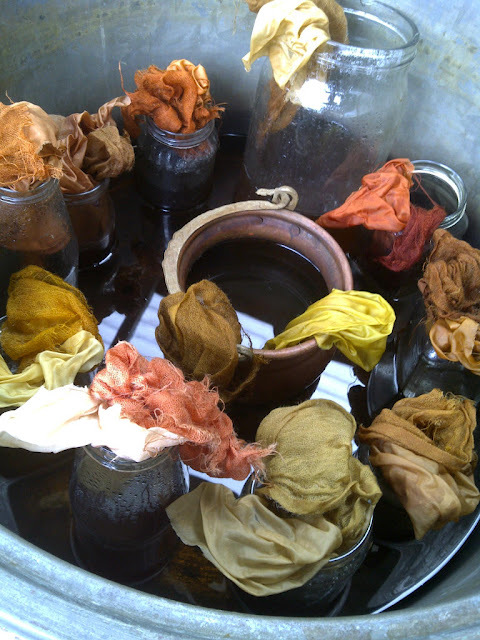 'Colour your textiles with plants' 1 day eco dye course. Cost $160, including materials and light lunch. In this 1 day course you will create submersion dyes with numerous plants and experiment with some simple techniques to pattern cloth. We will also explore the magic of eco prints and play with scrap metal to see some of the unique patterns and effects that can be achieved through a combination of these techniques. This course is suitable for beginners and dabblers of dyeing who may like a little more guidance with these techniques. You will leave with new creative ideas of how to make your fabrics unique and beautiful, using natural dyeing techniques. Great for any textile enthusiast. A sample pack of fabrics is included in the price, this will include silk and wool fabrics to experiment with, string for tying bundles, some silk thread for stitching, and a scarf for dyeing. More scarves and fabric will be available to buy on the day. You are also welcome to bring in some small pieces of natural fabrics of your own that you may like to experiment with.